I saw that little quip online this morning and I thought it was funny. Blizzard conditions are currently raging outside. It is the middle of April. There has to be a positive, even if it’s acknowledging that hey, at least in the Great Plains we don’t get hurricanes, too. I’ve mentioned before that I love winter, and I do, but that’s when it stays inside the confines of winter. We are almost a month into spring with only a few warm teasing days, and I think I speak for everyone when I say a little break would be nice. The kids are getting antsy at school. The farmers are getting antsy for spring’s work. Even the tractors look antsy. 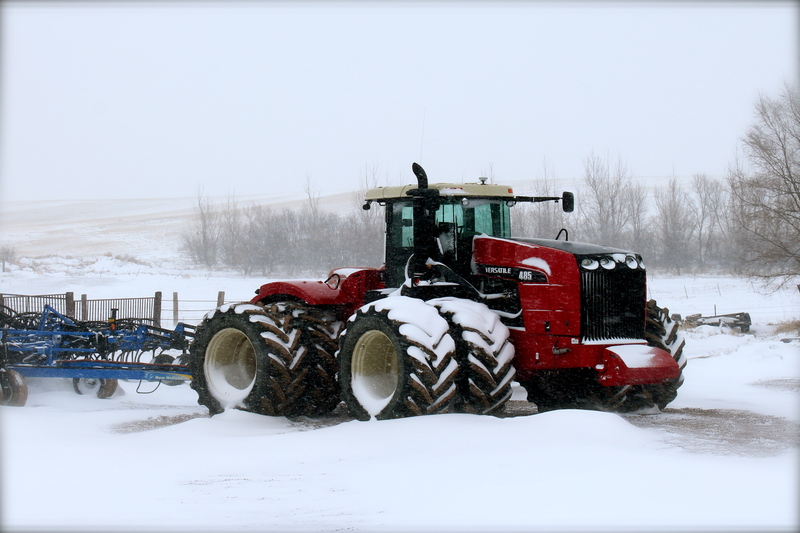 Outside my window, our big red is sitting in the snow, ready for seeding. But he’s not going anywhere. Just like me. Meanwhile, I thought I would occupy my time indoors by reading through some of my most recent freshmen essays, and I thought I might share with you some of the wisdom out of the mouths of babes. In this essay, I asked my students to address a problem in our school or community and propose a possible solution, using both their own wisdom and outside sources. While they are not exactly “babes,” freshmen in high school are fairly new to exploring and writing their ideas clearly and logically. It can be a real struggle, let me tell you. Why shouldn’t they be able to demand that school is canceled forever for all students? Why shouldn’t they be able to ask for a Six Flags amusement park in their small town in western North Dakota? They had some decent ideas, actually. The state of North Dakota is scrambling to keep up with the massive demand of an increased population: housing shortage, services shortage, and higher rate of crimes and traffic accidents, among other things, and it’s obviously not an easy job. However, the fact that my students were able to identify some of the serious and the less serious problems in their community and propose meaningful solutions made my chest puff up a little with, well, pride. But lest you go around amazed at my teaching skills and ability to coax well-written essays out of previously clueless students, something like the English teacher in the film Freedom Writers, let me share that it’s not quite like that. Not all of my students are so, well, eloquent. Here are some from the other side, some that help keep me humble as a writing instructor, so my head — and my ideals — don’t get too big. I do enjoy my students and their various colorful ideas, even the not-so-eloquent ones. In my classroom, we’ve had many discussions over issues like these, inside our small community and across the state and even the country. Students keep our jobs as teachers interesting, and as long as we stop to hear what they have to say, we may be surprised, even pleasantly surprised. Try it sometime. Listen to a kid. Heck, listen to another adult. In our crazy piece of land called the oil patch, it’s worth hearing some of the stories that people have to tell, some of the places that people are coming from. This April storm outside my window, however, is not much of a pleasant surprise. When winter’s good and ready she’ll leave. Hmmmmm…applies to a lot of things!